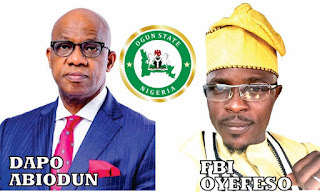 Home Unlabelled Dapo Abiodun Will Not Let Us Down, FBI Oyefeso Assures Ogun State Youths. Dapo Abiodun Will Not Let Us Down, FBI Oyefeso Assures Ogun State Youths. The youngest Gubernatorial Candidate in the Just concluded election in Ogun State, FBI Oyefeso reassure the youths that he is supper confident in The Governor Elect Prince (Dr.) Dapo Abiodun, in a brief interview with news men, mr Oyefeso said " the decision of the youths of Ogun State on the 9th March will not go unrewarded, Dapo Abiodun possesses the tripartite quality needed to govern our great state, Character, Competent and Capacity"
According to Mr. Oyefeso, leadership are born for a specific purpose of solving the problems the society is faced with, and for such a time like this, we can not wish for a better leadership in Ogun State other than the Newly elected Gatekeeper Of Ogun State, Prince Dapo Abiodun, a man with a Golden heart for development and a down to earth philanthropist. It may be recalled that FBI Oyefeso as a Governorship Candidate declares his support for the Governor Elect prior to the Election Day and directed his networks of supporters across ogun state to work for Dapo Abiodun and he also toppled as the Ogun State Cordinator of The Coalition Of Young Candidate of the Federal Republic of Nigeria to endorse Dapo Abiodun, the Coalition comprises of young candidates from various political parties vying for house of Assembly election in Ogun State. On the response to the communique of the Coalition released to the media which demands 50% youth Inclusion in governance, youth Underemployment/ Unemployment been addressed and access to Youth Corporate Social Responsibility Fund, mr. Oyefeso responded that he's optimistic that the Governor Elect will do justice to the demand of youths in the state, "Prince Dapo Abiodun is a responsible man, and all we demanded is to have a responsible leader govern our state and that's what we get, so there's no cause for Alarm." When asked whats next for him since the election is over he said " am a youth development consultant and a social entrepreneur so am back to work, as a youth Activist my job continues until Nigeria youths are giving their rightful place in governance and also provides the opportunity for economy development without any societal hindrances" it's the responsibility of every government to provide enabling opportunity for the youths to grow, that demand is priceless and not negotiable, if government can invest hugely in Capital goods and human capital resources of our youths then our nation productive output will grow drastically, every developed nation of today invest hugely in their human capital through capital goods investment, we can do better because we have a vibrant labor force, and until that happen we will never rest. 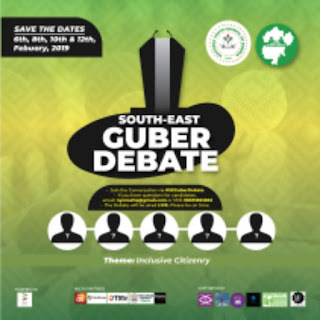 And when asked if he will work with new government when called upon, he reiterated that " I am always ready to serve in any capacity I may be entrusted with" at the center of my heart is to see Ogun State emerge as a Leading Edge State and that can never happen if stakeholders like me go to rest after election, It's my civic responsibility to contribute to the development of my country and that I can't negate and moreover NextLevel is for everybody that wants Nigeria to succeed.